"The kids really enjoy working with RoboArm. It is easy to make the robot be an educational tool rather than a toy." YouthTouch utilizes an array of hands-on learning tools created for elementary students. Special	software provides a unique opportunity to program a real-world robotic arm, RoboArm. 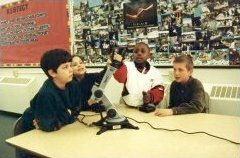 Younger students use a joystick-controlled robotic arm, RoboAC. RoboVue is a miniature closed-circuit	television camera that easily attaches to RoboArm and RoboAC. A tabletop fluid power training system, HydrauLift, uses common tap water for power. HydrauLift2, a more advanced system, is controlled by students from a personal computer. YouthTouch stations allow students to produce immediate results that they can see and touch. Tempest, an electronic console that suspends plastic balls on columns of air, incorporates RoboAC in student challenges that are designed to develop teamwork	and analytical skills. Automated timing and scoring create further incentives for students to participate. The equipment is easy to use, and directly interfaces to classroom computers. YouthTouch equipment provides students with real-world experiences that are a giant step beyond typical educational software. The YouthTouch system is rugged, portable, and designed to fit any classroom configuration. Please leave your questions or comments.